In 1985, Susette Kelo, of New London, Connecticut, lost her home via eminent domain to development by Pfizer, an American multi-national pharmaceutical corporation. It happened, thanks to a divided U.S. Supreme Court decision, Kelo v City of New London (1985), which expanded the definition of ‘public good’ to include increased tax revenues and jobs to the local community. Prior to 1985, ‘public good’ meant things like hospitals, roads, airports–in other words, things that benefit the public. The sole beneficiary of Kelo v City of New London was Pfizer Corporation. After demanding and destroying the homes of private citizens, however, Pfizer built nothing, provided no new tax revenue, and no jobs. But Pfizer did rip the taxpayers off for tens of millions of dollars. Evidently the ‘public good’ in ‘economic development’ meant the Pfizer Corporation. No matter what the politicians, corporations, and their lawyers concoct to redefine public good, we all see it for what it is: pickpockets finding a legal way to steal. 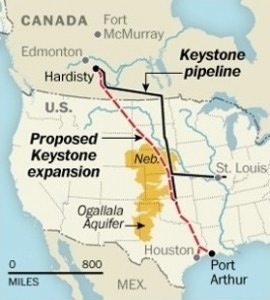 In today’s news, eminent domain rears its ugly head as an unintended consequence of the Keystone Pipeline project. No matter which side of the political divide you’re on, the government having the right to take your private property to a developer is complete and utter nonsense. Why anyone supports this debacle that will graetly benefit a private corporation in Canada, with dubious to non-existent benefits to U.S. citizens, as well as the potential destruction of our landscape is beyond rationality. Canada has rules, you see, prohibiting oil pipelines snaking across their land. But not ours. Taking advantage of the absurdity of the Supreme Court decision as well as weakened environmental laws (thanks to the GOP), the non-USA company, Trans Canada Corporation plans to build this controversial pipeline project all across the midsection of our land, and is filing condemnation lawsuits for the property they’ll need for the pipeline all along the way. Before they even have the permits to build the pipeline. Trans Canada Corp used the same Supreme Court decision to condemn private property that Pfizer Corp used in the City of New London. Moving oil across a continent is considered ‘for the public good,’ evidently. These suits are very expensive for a private citizen to fight. Some people, like the Crawfords in Texas, are fighting and have taken to the internet to get some help from the rest of us. A group of Nebraska landowners banded together and have filed suit against their state for selling them out. In my ecofantasy novel Corvus Rising, the iconic and enchanted Wilder Island is threatened by an condemnation lawsuit brought by a wealthy developer who has asked the local government to condemn the island under eminent domain and sell it to him. He plans to scrape it clean of the thousands of native birds on the island, as well as all the wild wilderness of trees, and build a gambling resort open to the public. That there is a humble yet consecrated chapel on the island, or that the island and the chapel are owned by the Jesuit Order of the Catholic Church, is irrelevant. Neither God nor the wealth of the Vatican can stop Eminent Domain. Neither in Corvus Rising, nor in 21st century America can even the uber-wealthy Catholic Church stop eminent domain. 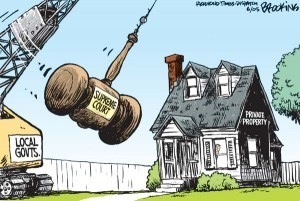 The one way around eminent domain is public outcry. Let’s hold on to each other’s hands on this rare issue upon which we are not divided. We must stand together, across the political divide. Stand with the Crawfords and all the others in the path of the Keystone Pipeline. That’s what the birds did, the heroes in Corvus Rising.